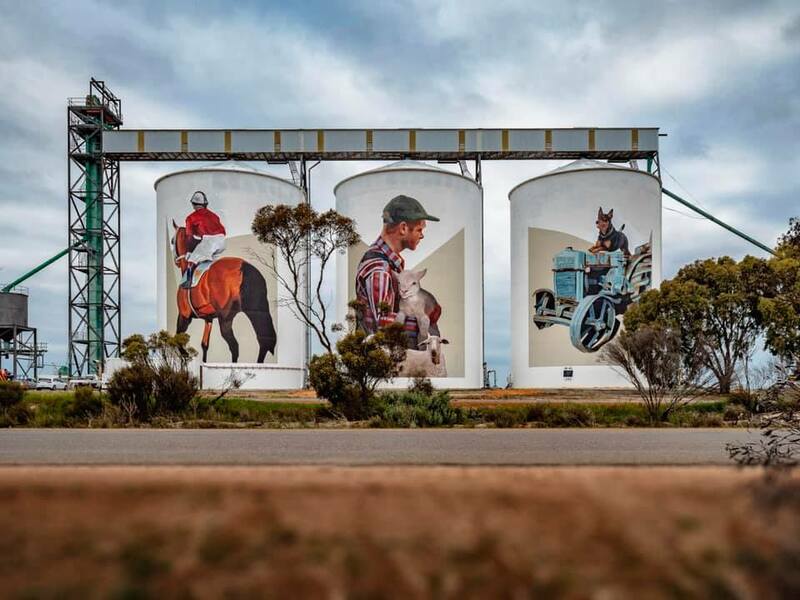 Explore the Wheatbelt following this new trail which has brought world class murals by local and international artists to transform grain silos, public walls and transformer boxes artworks in a number of country towns. 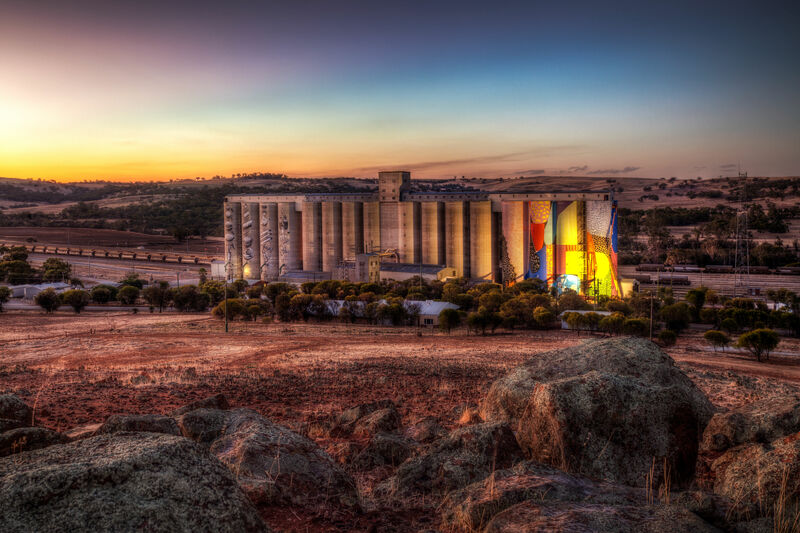 Internationally renowned artists HENSE (USA) and Phlegm (UK) transformed eight CBH Group grain silos into iconic works of art dramatically responding to the unique landscape of the Wheatbelt town of Northam. The silos were painted each at a height of 35 metres (an area of roughly 5500 square feet) over 16 days and using around 740 litres of paint, creating Australia’s first silo mural. 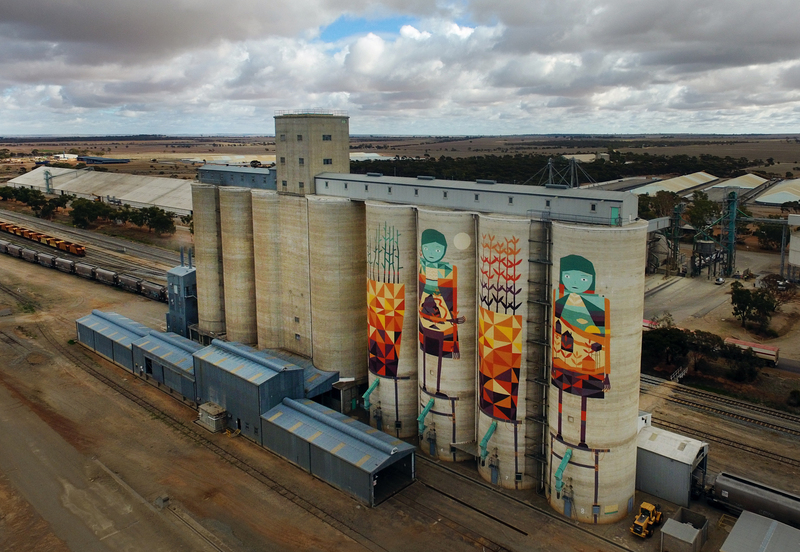 Urban artist Kyle Hughes-Odgers transformed 4 of the 8 concrete silo cells at CBH Merredin. Through his characteristic geometric yet playful style, Kyle depicts the importance of the agricultural industry to Merredin and the Wheatbelt region. The colours are taken directly from the Wheatbelt’s natural environment: the burnt oranges, yellows, and blues are from the landscape and sky. Native Western Australian wildlife has taken centre stage in sky-high silo art for the mural at Newdegate. Brenton See’s mallee fowl, lizard, phascogale and tree frog have been dazzling above the treetops in Wheatbelt town. One Silo features a local resident, the Western Bearded Dragon (Pomona minor minor), namesake of the nearby Dragon Rocks Nature Reserve. Dominican-born muralist Evoca1, painted the silos in Pingrup which, acknowledges WA’s tenacious, resourceful farming communities. Evoca1 took 15 days and 230 litres of paint to create the mural, painted on three silos, each 25 metres high and 15 metres wide. 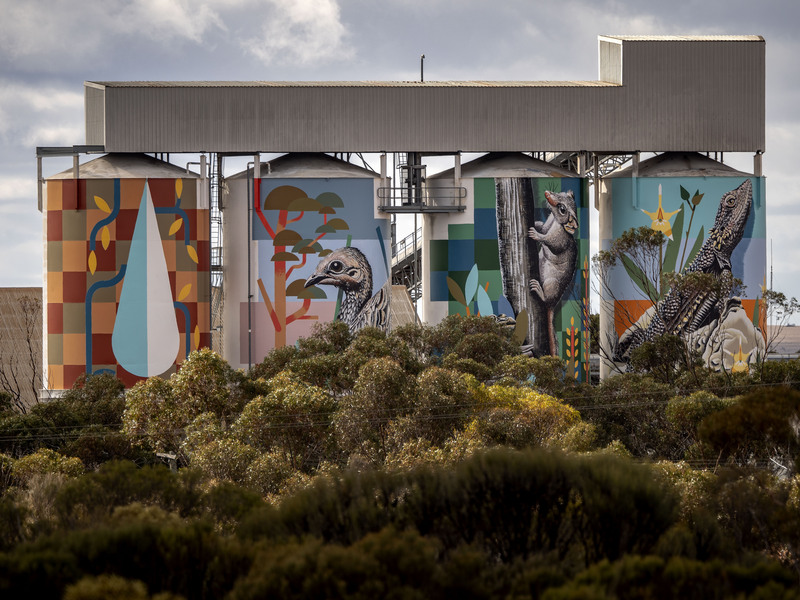 Fremantle-based artist Amok Island created PUBLIC Art in Ravensthorpe’s Six Stages of Banksia baxteri, a 25 metre high wildflower inspired mural painted across three CBH Group silos in Ravensthorpe. 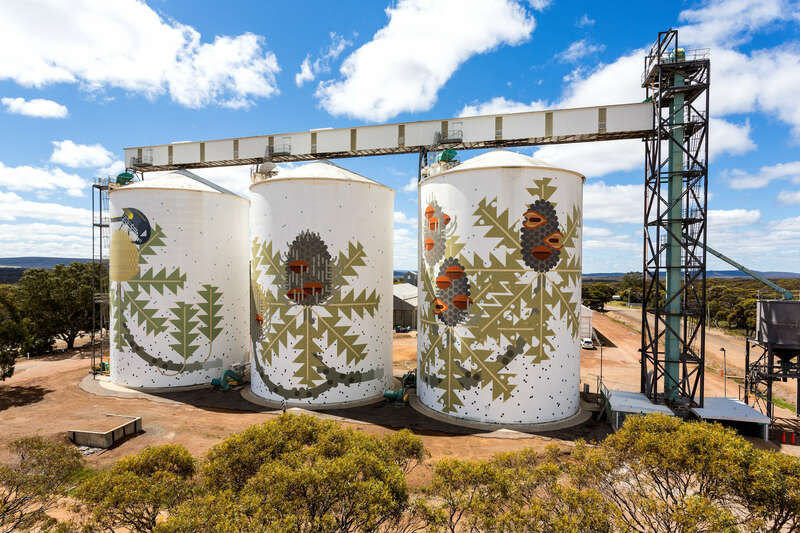 Each silo side shows a different stage of the flowering cycle of this species of Banksia: from flower buds, to full bloom, to seedpods developing, drying out and opening’, explains the artist. Brooklyn-based street art duo Yok & Sheryo created the fourth mural in FORM’s PUBLIC Silo Trail over 17 days of painting and after 180 litres of paint. 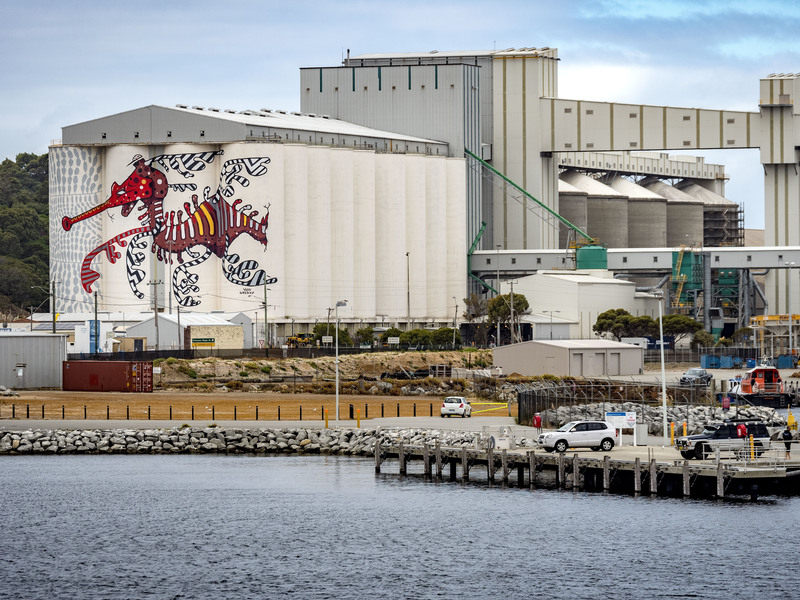 Taking inspiration from two species of seahorse found in the coastal waters of South-Western Australia, the Ruby Seadragon and its leafy cousin, the 35 metre high and 50 metre wide mural now sits proudly across the giant silos at CBH group’s Albany Grain Terminal. Photographs by Bewley Shaylor, courtesy of FORM. An immersive art installation by Bruce Munro gently illuminating the Avenue of Honour at Mt Clarence in homage to the Anzacs who departed from Albany for the Great War.